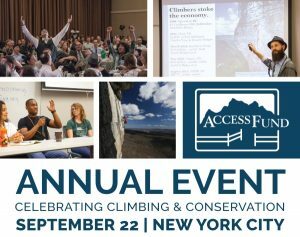 You don’t want to miss the upcoming Access Fund Annual Event – because this year, it’s on our side of the country, in New York City on September 22, 2018! 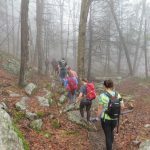 The Gunks Climbers’ Coalition board of directors are actively involved in helping the Access Fund prepare for the Summit and will be in attendance. 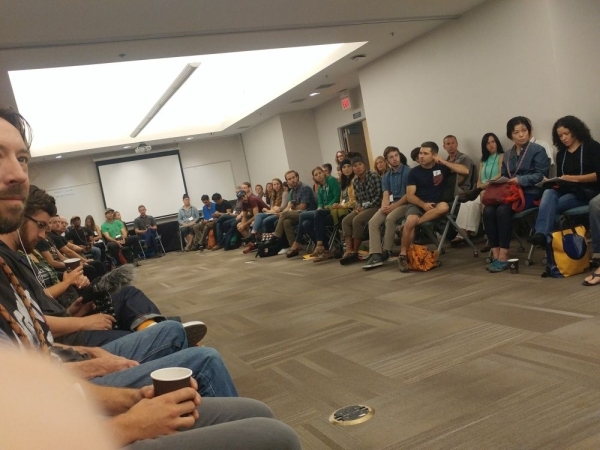 Share your passion for climbing with other advocates and local climbing organizations at this informal informative conference. 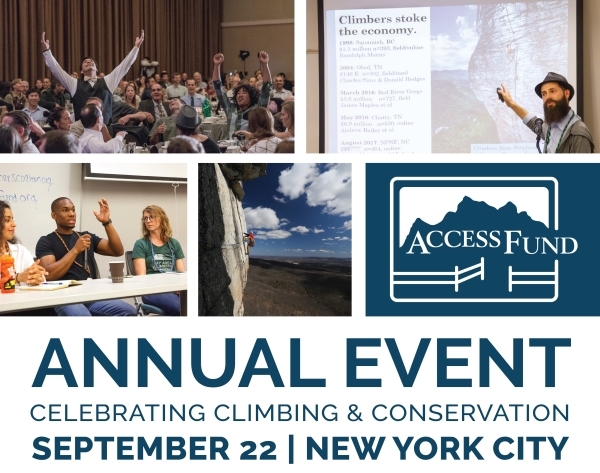 Learn advocacy skills with panel discussions and workshops that will empower you to help the climbing community with access, maintenance and protection of the crags we love. 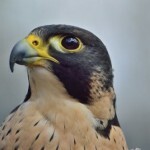 Network and meet others that share your passion. 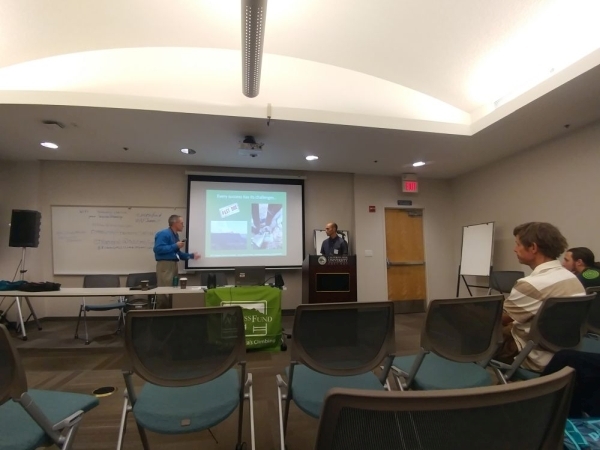 The Gunks Climbers’ Coalition will also be co-hosting a session, “Cliff Ecology, Fixed Anchors, and a Gunks Case Study.” Check out the day’s agenda of sessions. Access to this informative day of learning and networking is ONLY $25! Order your ticket to the summit here. 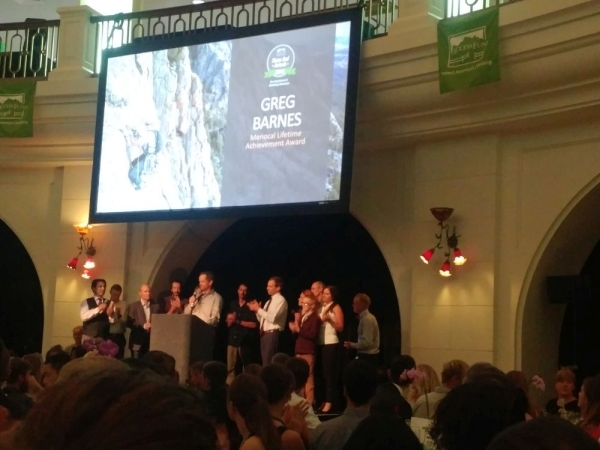 In the evening, we get all dressed up to wine and dine with our fellow climbers, including numerous climbing legends – like Lynn Hill, who is the keynote speaker, and emcee Timmy O’Neill. There will also be the presentation of the Sharp End Awards, and lots of amazing goodies that will be auctioned off at this important annual fundraiser for the Access Fund. Tickets to the annual dinner are $175 for early bird pricing (up to July 29th), and $200 after July 30th (with a portion of it tax deductible). Find out more about the dinner and order tickets here. 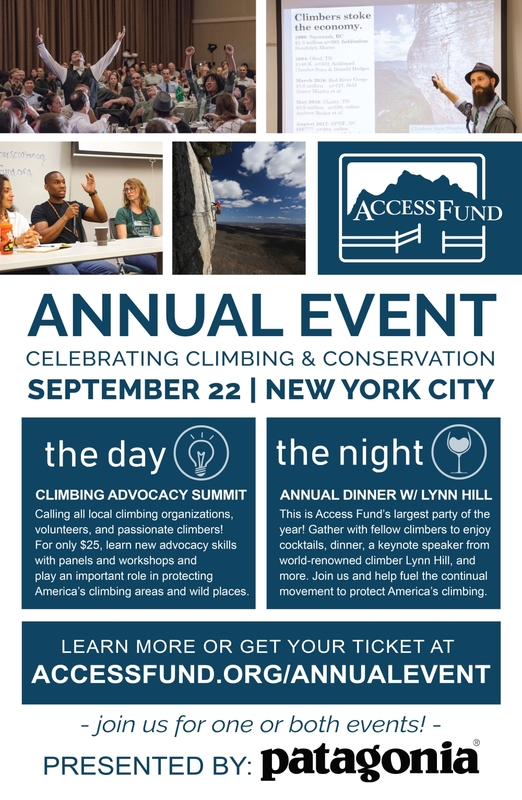 Continue scrolling after the flyer below to see some photos from the 2017 Access Fund Summit and Dinner. The introductory session at the 2017 Access Fund Climbing Advocacy Summit in Oakland. Yes, that’s Tommy Caldwell sitting in front of the screen. 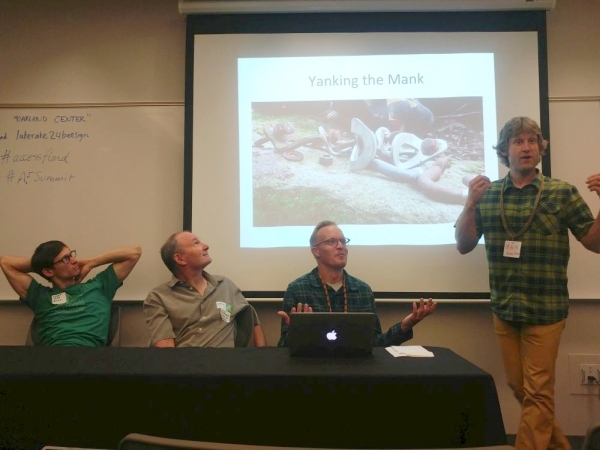 Our Access Fund NE rep, Mike Morin hosting one of the sessions at the 2017 Access Fund Climbing Advocacy Summit in Oakland, CA. Can you spot the climbing legend at this session? 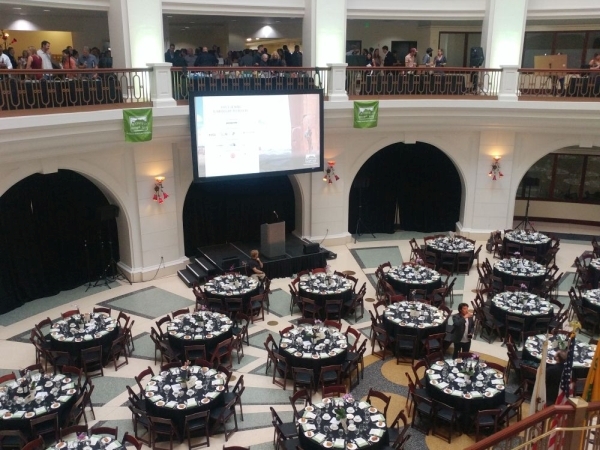 2017 Access Fund Annual Dinner – pretty fancy setting for a crowd usually covered in dirt! The balconies had multiple tables with silent auction items. 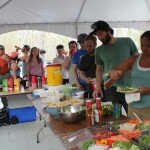 Jimmy Chin was the keynote speaker. Presentation of the Sharp End Awards. 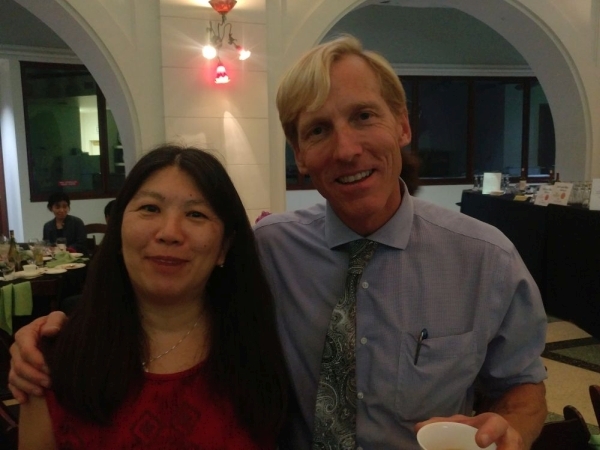 GCC Secretary, Jannette Pazer, with Hans Florine at the 2017 Access Fund Dinner in Oakland. Don’t Get Stung by Ground-Nesting Yellowjackets!